When you are living with aphasia, no one understands what you’re going through quite like those who are going through it, too. 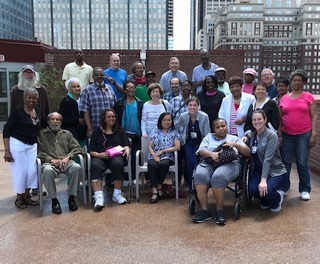 The Aphasia Community Support Group at Magee Rehabilitation Hospital is made up of a diverse group of men and women living with aphasia and the many caregivers who support them. Some members have been coming for years; others just a few months. It is a lively crew and a meaningful experience for all involved. Everyone in the group supports one another and comes together each month to share advice and to offer words of encouragement and hope. Magee Rehabilitation Hospital is located in Center City, Philadelphia. The Aphasia Community Support Group at Magee was started in 1991 and has been nationally and locally recognized for its advocacy over the course of its existence. The group provides an opportunity for individuals to practice speech and language skills in a safe and supportive setting, provides education about aphasia, and encourages socialization among its members. The resounding message shared by all is that life doesn’t stop because of aphasia. The group members are full of new ideas and are always thinking of new ways they can spread awareness about aphasia and advocate for themselves. The members do not let their communication difficulties stop them from changing the world and making a difference. In 2013, group members generated an “Aphasia Proclamation” for Philadelphia’s mayor to sign, which officially declared the month of June as Aphasia Awareness Month in Philadelphia. In addition to being a place for members to share their fears, strategies, and experiences, Magee’s support group is a place for members to come together to advocate and spread awareness about aphasia to the community. Looking for a support group in the Philadelphia area? Our aphasia group meetings are held at 1 p.m. on the first Tuesday of each month (except for the month of August) at Magee Rehabilitation Hospital. If you would like to receive more information about our support group, please contact Ashley Shapero at (215) 587-3484 or at ashapero@mageerehab.org.